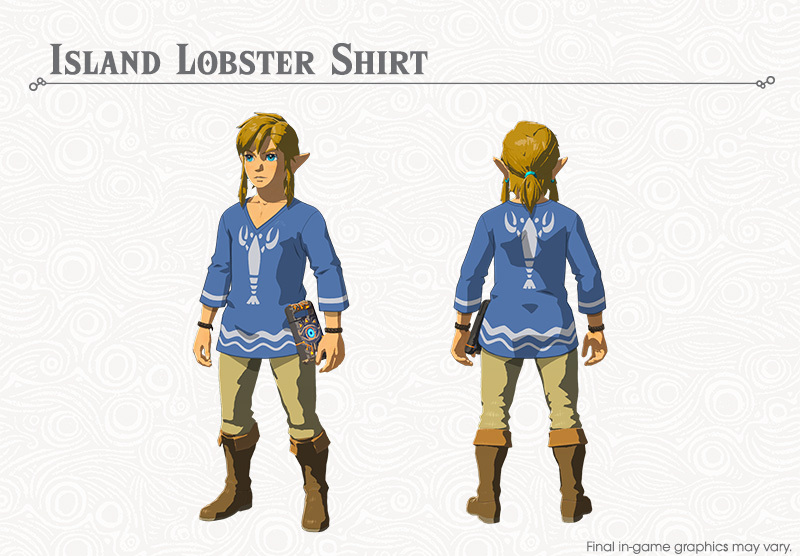 Island Lobster Shirt is a costume in Zelda Breath of The Wild. It’s part of the newly released Champions’ Ballad DLC, and also a throwback to one of the previous games, where Link also used to wear it. You can obtain it by following a clue from Misko’s diary, but his instructions aren’t entirely clear. If you’re stuck trying to find it, we’re going to help you by showing you the Zelda BoTW Island Lobster Shirt location. If you’ve read Misko’s journal and started the Garb of Winds quest, you’ll know the shirt is “where the Menoat River was born”. That’s the relatively short river in the south of the map, the one connecting Lake Hylia with the Faron Sea. Go to the northernmost point of the river, and look for a small island on its west side. The chest will be in the water, in the gorge between the island and the west bank. It’s a light blue shirt with a white lobster on the chest and a wave pattern near the bottom. It’s not only pretty to look at, but also provides heat resistance – but you probably already have a bunch of heat-resistant armor.